This. I have some involvement, I am delighted to report. I can say no more. This entry was posted on March 18, 2014 at 9:36 am and is filed under FILM, MUSIC with tags A Hard Day's Night, Criterion Collection, Richard Lester, The Beatles. You can follow any responses to this entry through the RSS 2.0 feed. You can leave a response, or trackback from your own site. Almost half a century ago, at a drive-in in Fayetteville, NC on a hot summer night. Younger sibs asleep in the back of the Volkswagen bus. This 8 year-old was completely entranced by the Boys and the kinetic film-making, even though I understood almost none of the dialogue/”dialect”. I saw it the day it opened in New York, catching the second show. standing behind me in line were a group of girls who were reciting the dialogue which they had committed to memory from having seen the first show. The Beatles were a hit British pop band. A Hard Day’s Night made them international stars of a sort never seen before — or since. 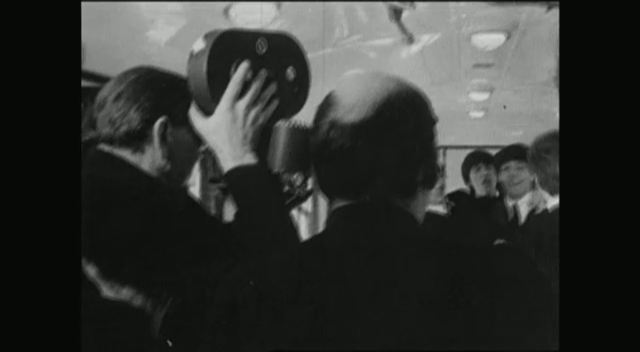 Even having spoken at length to the director and worked intimately with the footage from the film and the behind-the-scenes material, I find it impossible to imagine the excitement the Beatles must have generated. But the movie does capture a lot of it. Saw the boys onstage in their Christmas show at the Finsbury Park Astoria in December 1963. It was quite an experience. Then saw the film in the first week of its UK release. It was quite an experience. Did you scream? I am fascinated by the screaming — such a strange response to musicians. DoP Gilbert Taylor declined to be involved in the follow-up film because he was so disturbed by the hormonal outpourings he witnessed at the concert scene. No, I was far too cool to scream! But thousands did. Doesn’t screaming pre-date the Beatles by several decades? Wasn’t Sinatra the first? Sinatra certainly inspired screaming if the cartoon parodies are anything to go by. A couple of decades earlier. But did anyone scream in Britain at that time?